Since 1991 the Sisters of Fraternity Notre Dame have operated a soup kitchen in New York. When they first arrived here from their native France they couldn't speak a word of English, but were still eager to help out in their new community. Aside from feeding up to 300 needy people a day at the kitchen's storefront in Spanish Harlem, the nuns dispense food in Times Square and care for AIDS patients at local hospitals. Of course all this selfless altruism needs an outlet. In addition to singing in a gospel choir, some of the sisters partake in a tae kwon do program. Although one is likely to assume that this is strictly for self defense on the mean streets of New York, the Order insists it's mostly for recreation and fun. Sister Mary Chantel, probably the most formidable student (see photo), also has a black belt in judo. Not to mention a nice flying side kick! 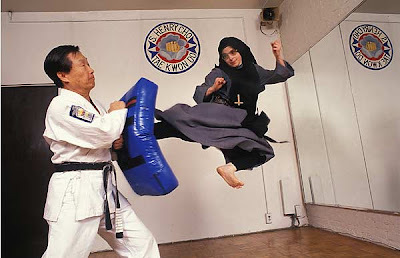 Tae Kwon Do Nuns. Only in New York. I think it's great! And yeah, a bit jealous on that kick here too as well. How DO they do that? I think I'd hurt myself just trying. One of the things I love about the martial arts is that it really takes you away. It's major stress relief for me. Seems like a good outlet for just about anyone. Gives meaning to the phrase "Don't judge a book by its cover". Just because their nuns doesn't mean they can't take you down if they have to. :)Great story! I saw a similar one on TV where a group of nuns were learning Wing Chun. Very interesting. Like I always say, never kick to the head! Isn't it? Me too, but I'll get over it. How DO they do that? I think I'd hurt myself just trying. All nuns fly, didn't you know that? Actually Sister Mary is on the small side (just over 5') which probably helps her get airborne easier than larger folks. Jump kicks are rare in Isshinryu, which is fine by me. (In the katas Chinto and Kusanku, jump kicks make an appearance.) For me, getting off the ground is one thing, landing is another matter. Great story! I saw a similar one on TV where a group of nuns were learning Wing Chun. Thanks. Interesting about the Wing Chun nuns (I'm assuming you mean Christian nuns), because that style was founded by a nun from the Shaolin order in China about 300 years ago. Now THAT is cool. I, too, am quite in awe of her flying side kick. I look like a moose trying to fly when I attempt one. I certainly don't have the form this woman has. Tae Kwon Do is only a cover for their own deadly martial arts that have secretly been practiced in convents for centuries. That's so awesome!!! I love that picture, and it is indeed quite an impressive side kick. Flying nuns rule!! Flying side kick? I can't even get off the ground! I'm also in awe of her. Wow! How awesome is that?! Love the comment about the secret convent art! As for her being able to do that because she is small, I'm not so sure about that. I'm only just over 5 foot but I find it really difficult to get off the ground! It's like I'm stuck because I'm closer to it! Let's hope there was some kind of spring board just out of shot! Wouldn't that thing on their head become a problem? Visibility wise. I remember a tkd competition where girls with a veil were not allowed to compete because of security issues. Needless to say, that raised some heated discussions! Only in new york? Maybe! That thing on their head (in addition to the rest of a nun's attire) is called a habit. The habit is what propels them into the air. And because it's called a habit, their TKD regimen actually becomes habit forming. The habit (what they wear) also serves as a radar device, solving the visibility problem. I'd give you more info Mat, but I'm saving it for my doctoral thesis in aerodynamics.